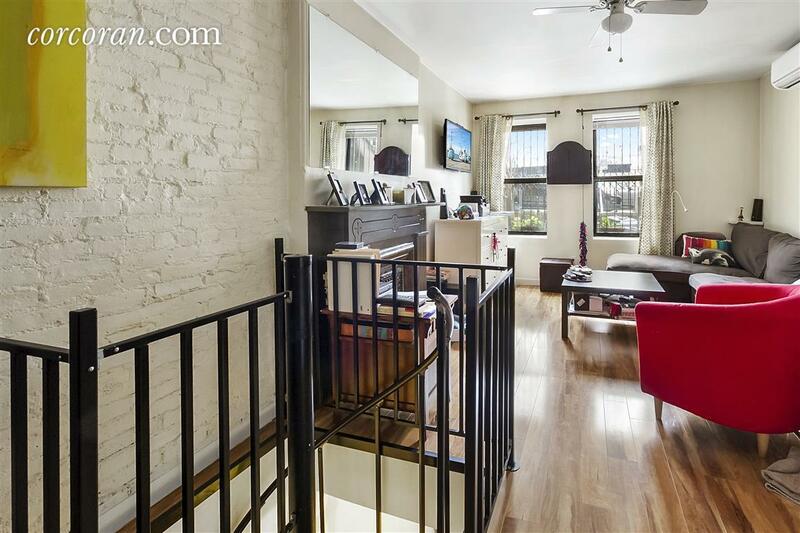 Here’s a historic Harlem townhouse, at 30 East 130th Street, now up on the rental market. From the exterior, it has pretty much retained its 1900s-era features. 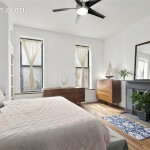 But the interior is a mix of the historic and the new as the result of a 2012 renovation. It’s the type of place we picture a bunch of young professionals pooling funds to rent–at $7,500 a month with six bedrooms, you’d get decent bang for your buck. 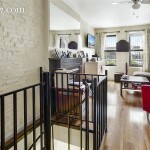 And what young New Yorker hasn’t dreamed of renting a townhouse with all of their friends? 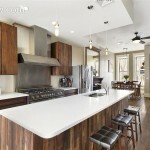 The kitchen is really the star of the show here, and what looks to be the focal point of the renovation. 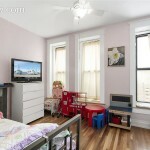 It’s located on the parlor floor, so you’re greeted with the dining room and kitchen as soon as you enter the house. 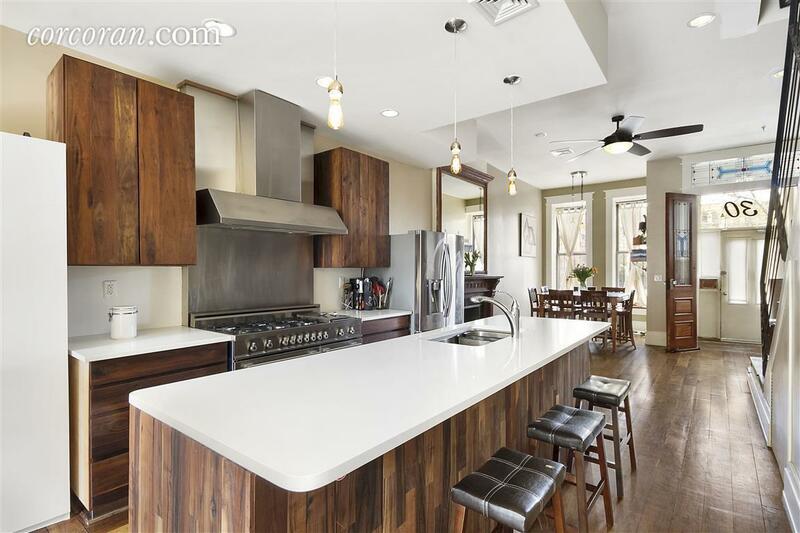 Here are the new features of the kitchen, per the listing: “A huge caesar-stone island, a 48″ Bertazoni 6 burner gas, griddle and double oven.” The dark wood cabinets, new lighting fixtures and high ceilings make this a pretty unique space. 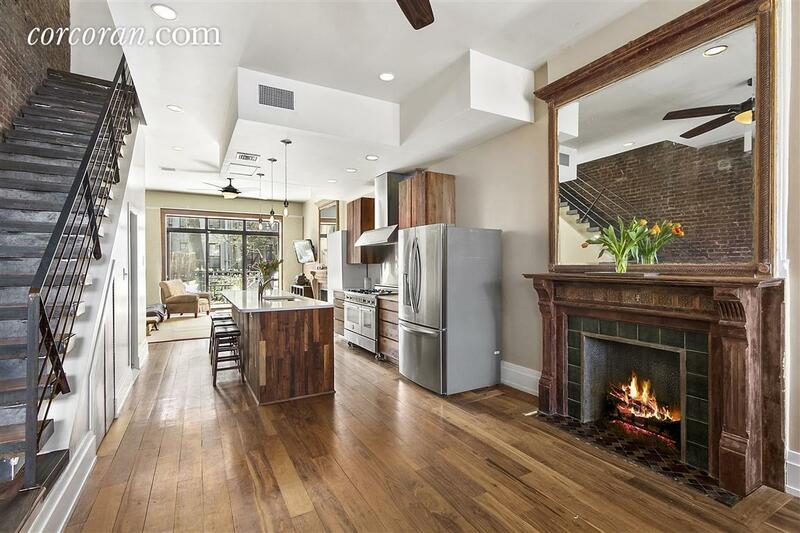 It’s all open on the parlor floor, creating a seamless dining, kitchen and living room space. Here’s the living room at the back of the parlor floor. It’s a little more historic, with the original fireplace mantle. 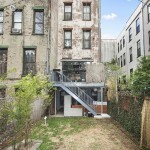 This area leads to a very cute deck (perfect for BBQing!) and stairs that lead down to the backyard. 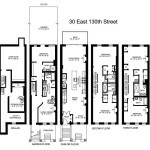 It’s a triplex space with plenty of room to spread out. There are four bedrooms on the upper floors, each with an ensuite bathroom. The garden level comes with two more bedrooms. 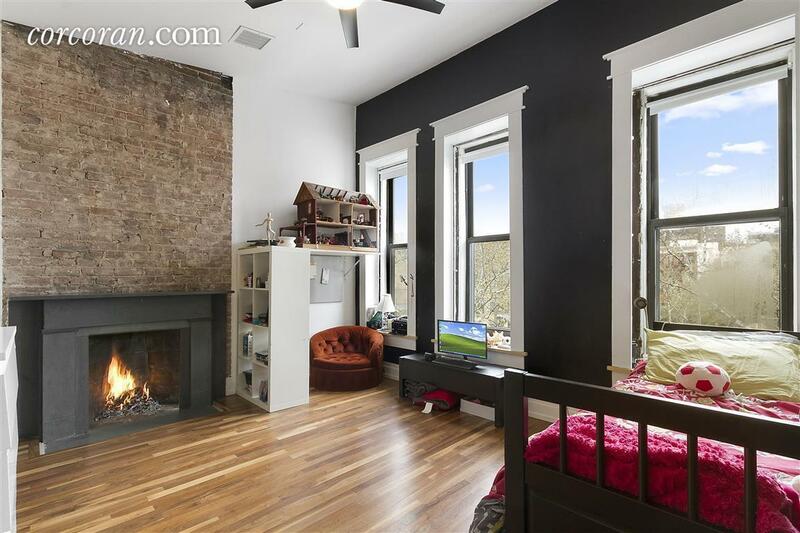 This bedroom is particular lovely, with a fireplace, exposed brick, and three big windows. 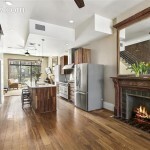 That’s walnut flooring, which spans throughout the home. Another one of the bedrooms also has its own fireplace. 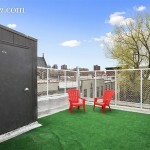 One awesome perk of townhouse rentals: lots of outdoor space. 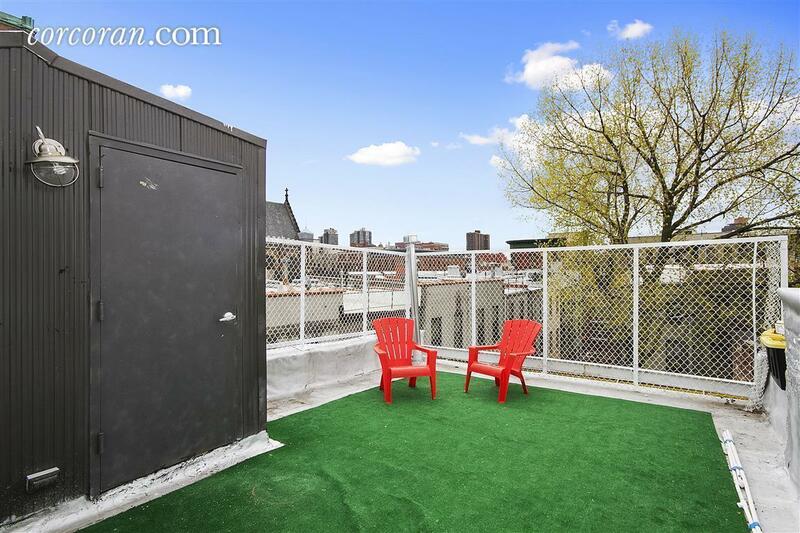 This rental comes with a private roof deck, a deck off the kitchen, and a backyard. Sure, the roof and backyard look like they could use a little TLC. 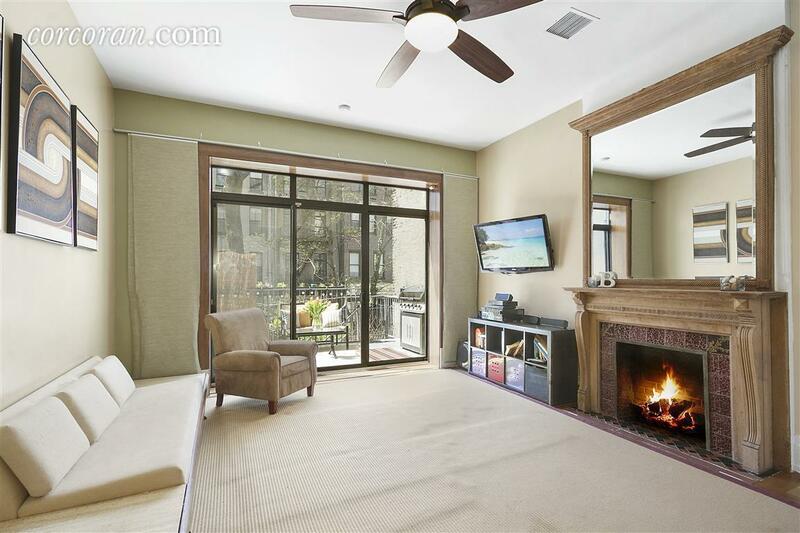 (Have you ever seen astroturf put to use at a Manhattan townhouse before? Even outdoors, it’s a no-no.) But it will still do the job when you’re just looking for a place to relax in the sun. 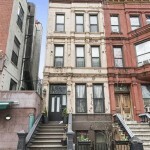 The property is also just a two-block walk from Harlem River Park, five blocks from all the train access to Harlem, and six blocks from the beautiful and historic Marcus Garvey Park.